Cuccidati are traditional Sicilian Christmas cookies—try my family recipe enjoyed for three generations here in America! Italian Christmas traditions are unique to each region of the Italy and have been lovingly handed down within families through the generations. Cuccidati – a version of Christmas cookie that probably originated after the Arabs introduced oranges and almonds to Sicily centuries ago – play an important part in the Christmas celebration in Sicily even today. All Sicilian cuccidati, or any Italian cookie for that matter, are unlike what Americans think of when they think of cookies. Most Italian cookies are made from dough that cooks up drier than American cookies and there is much more variation in the presentation. Sicilian cookies come in a multitude of different shapes and sizes and fruit fillings are often enclosed in the cookies as a special treat. The recipe given below is for a Sicilian Christmas cookie—my family calls them “cuccidati,” although they are not identical to most of the cookies found online under this name. The cookies in this recipe start out as the “typical” cuccidati: one long “tube” of sweet, Italian pie-crust-like dough, which contains a dried fruit and nut center. (No figs in our version, by the way.) But, instead of then cutting the tube into bite-sized pieces that are finished with icing, my family cuts larger pieces, which are then formed into different shapes, and finishes the cuccidati with a sprinkle of powdered sugar. Whatever the name, this is just one version out of many dried, fruit-filed cookies still made in Sicilian bakeries today to celebrate the Christmas season. When I was a child, my family always gathered the weekend before Christmas to share our creativity while we formed our cuccidati into wreaths, ribbons, or candy cane-like forms. They could be completely covered in dough, which would allow for a creative, fringe-like covering, or left open. The sides could be pinched for decoration if like, similar to how Americans form a pie crust along the rim of their pies. If you would like to see how the various shapes of these cookies are made, visit the Stella Lucente Italian Pinterest site. 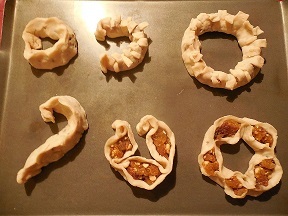 The ingredients for the cuccidati filling are considered easy to come by today, but remember that dried fruit, including raisins and oranges and spices like cinnamon were considered special when the cookies originated. These filling ingredients were only found only in well-off households. Since the filling ingredients are difficult to chop and mix together, in some Sicilian towns “back in the day,” people would bring their filling to the butcher to mix together for them in his meat grinder, which had been newly cleaned for the season for this purpose. Despite the few ingredients in traditional cuccidati, and the difficulty of making the filling with them, the dried fruit has a rich sweetness, the roasted almonds a robust flavor, and the cinnamon, orange, and citron add a complexity of flavor that goes beyond its simple ingredients. Try our recipe this Christmas season for a taste of Sicilian tradition! If you’re trying this recipe for the first time, it may be easier to cut the recipe in half. Makes 2–4 dozen cookies, depending on the size and shape of the cookies created. Sift the flour, salt, and sugar into a bowl. Cut in the lard with a fork and/or your fingertips until it is the size of small peas. Add the cold water a little at a time, while mixing with a fork. After about 1 cup of water has been added, gather the dough and test it to see if it holds together. If it does, form one large ball. If it is too dry, add more water, mix, and try again. Turn the dough out onto a floured board and press it together with a soft, gentle kneading motion with the palm of your hand until a dough forms. Form into one large disk, wrap in plastic wrap, and refrigerate for 30 minutes. First, chop the yellow raisins coarsely with a sharp knife so they open up. This is fairly labor intensive, and it may take a bit of time to chop all of the raisins. Then, chop the almonds coarsely with a sharp knife. If you have a small manual chopper/grinder specifically for nuts, put the coarsely chopped nuts into the machine and grind to obtain more finely chopped nuts, which can then be mixed with the raisins. Otherwise, try one of the next two steps below. Or: An alternative to the last step: pulse the pre-processed raisins and nuts in a food processor a few times if you have one, making sure the ingredients are not over processed. To the raisin/nut mixture: add the citron, orange peel or zest, and cinnamon and mix well. Form into 2 rectangular “logs” the shape of a loaf of bread. Cover with aluminum foil if not using right away and store at room temperature. Set up a kitchen table “assembly line” style: place the dough on one end on a surface that is good for rolling and cutting the dough, place the filling in the middle, and use the surrounding work areas for each member of the family to create the cookies. Place cookie sheets on the far end for the finished cookies. Cut off one strip at a time from the large dough ball and roll it out into pie-crust-size thickness. 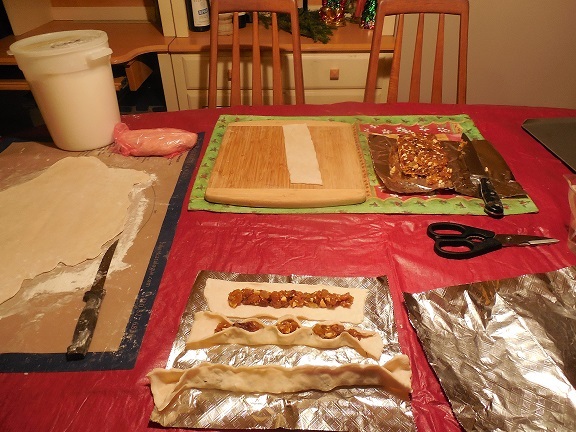 Cut the rolled-out dough into fairly thick strips, depending on the size of cookie desired. These strips can then be cut again crosswise to make the size needed to make smaller cookies. Cut rectangular pieces of filling from the filling logs to place into the strips of dough. Be creative! Create cookies with the sides brought up to cover the filling entirely, or leave the filling uncovered and just pinch the dough together to form various designs. Traditional shapes are round (like a wreath), horseshoe, or long or short ribbons. Candy cane shapes are popular with kids. Bake in preheated oven at 350° for about 20–30 minutes, or until the bottom of the cookie is nicely browned. The sides and top of the dough should be cooked but not browned. This will make a flaky crust and avoid burning the filling. Sprinkle with confectioner’s sugar when cool. 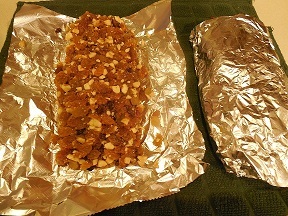 Cookies will keep for about 2 weeks in a cookie tin or covered with aluminum foil. *The original recipe passed down from my grandmother states that the flour and the lard should be mixed together and left overnight before the sugar, salt, and water are added to create the dough. I’ve never tried this and instead use the traditional “pie crust” method. is a teacher of Italian for travelers to Italy in the Peoria and Chicago area. Join my Conversational Italian! Facebook group and follow me on Twitter at StellaLucente@travelitalian1 and start to learn Italian FREE! Visit learntravelitalian.com/download.html to purchase/download Conversational Italian for Travelers and find more interesting facts about Italian food and culture in each chapter of our book! Learn how to buy train tickets online, how to make international and local telephone calls, and how to decipher Italian coffee names and restaurant menus, all while gaining the basic understanding of Italian that you will need to know to communicate easily and effectively while in Italy. —From the staff at Stella Lucente, LLC.